Welcome to Tutoni's, where each dish tells a story and every visit is an experience. Our menu of creative dishes and new spins on traditional Italian standards – rooted in our region’s abundant agricultural scene – offer customers a dining experience they can’t find anywhere else. We strive to pair top-notch service in a sophisticated-casual setting for a unique York, Pa. Italian restaurant experience. We embody the farm-to-table movement and take pride in working with local farms and farmers. Our seasonal menus emphasize the best local produce and meats grown and raised in Central Pennsylvania. Start off with our popular antipasto options, which include a charcuterie board that features a daily selection of cured meats and a cheese board with some of the finest cheese found in York and Lancaster counties. Warm up with a plate of calamari or a bowl of our always-changing soup of the day. Or, enjoy a refreshing salad made with local greens from Brogue Hydroponics and other seasonal additions. Our house-made pasta dishes are made from scratch daily – from traditional favorites such as our house ravioli and lasagna to true Italian gems like gnocchi and cavatelli – and are complemented with local flavors of the season, creating a meal that takes guests on a culinary journey that starts in “the old country” and ends right here in our downtown York, Pa., restaurant. Using the best local ingredients available, our entrée selection changes with the seasons. Prepare your palate for bursts of fresh flavors in the spring and summer and comforting, cozy creations to get you through the cooler months. And just when you think the meal couldn’t be better, our daily selection of heavenly house-made miniature desserts are the perfect sweet bite to end your experience. When was the last time you had a scratch cocktail, complete with homemade bitters? Ever want to know what a $200 bottle of wine tastes like? At Tutoni’s, we take your drink just as seriously as we take your meal, so we’re invoking the traditions of the old country while revolutionizing how to imbibe, from your after-work Old Fashioned to a post-dinner Chianti. Our Italian focused beverage program pays an homage to the classics using the best of the Pennsylvania growing season. Visit us for our Prohibition-style cocktails with a local twist, each concocted by our very own James Gibble. Oh, and about that $200 bottle of wine … We recently installed a self-serve wine system, where you pay for what you pour (1, 3 or 5 ounces) and can try all of the different varietals and vintages that you’ve always desired without having to buy the whole bottle. If you’re looking for the best tapas in York, Pa., try our "10 Under $10" tapas menu. Open at the TT Bar all week, treat yourself to these savory small plates that feature flavors that’ll tickle your taste buds. Monday-Saturday from 4-6pm, enjoy Cocktail Hour- $6 select cocktails & 3 for $15 tapas. Periodically, Tutoni’s offers an off-menu meal the comes right from the creative minds of our chefs. Each meal benefits a local, non-profit that betters the York community. A member of our culinary team walks guests through the Tutoni's philosophy of exceptional ingredients that are skillfully prepared and simply presented. Check out our latest chef’s table options here. It takes a talented team to help Tutoni’s succeed as a farm-to-table restaurant in York, Pa., with each member bringing a different skillset to the kitchen. Chef Dave Clarke was born and raised in upstate New York. Dave left New York to attend college at Indiana University of Pennsylvania and the Culinary Institute of America. When he finished his schooling, he became Executive Chef of The Blue Parrot in Gettysburg, PA.
Dave then moved into Philadelphia, PA to pursue his passion in the city. He has worked at numerous restaurants in Philadelphia, honing his skills in Regional Italian cuisine. His Executive Sous Chef contributions to the James Beard Award winning Vetri Osteria and art of fish butchery at Stephen Starr's Morimoto are just a few of his many accomplishments during his time spent in Philly. Dave has moved back to Central PA to cultivate the York County food culture. 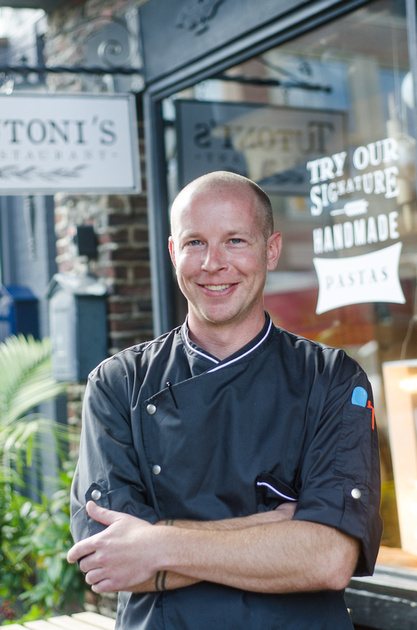 He will be creating farm to table dishes that will make you question why you haven't been to Tutoni's sooner! Tutoni's is the team of "Toni Girl" and "Tony Boy," whose families owned the first pizzeria in York County. Now they want to take it back to their roots, back to the old country with authentic Italian dishes made from scratch with the best ingredients possible. With more than a combined 30 years of experience in the hospitality industry, the Tonies take a unique and uncompromising approach to their guests' experience and hope that you'll come to their scratch kitchen, break bread, and stay a while.